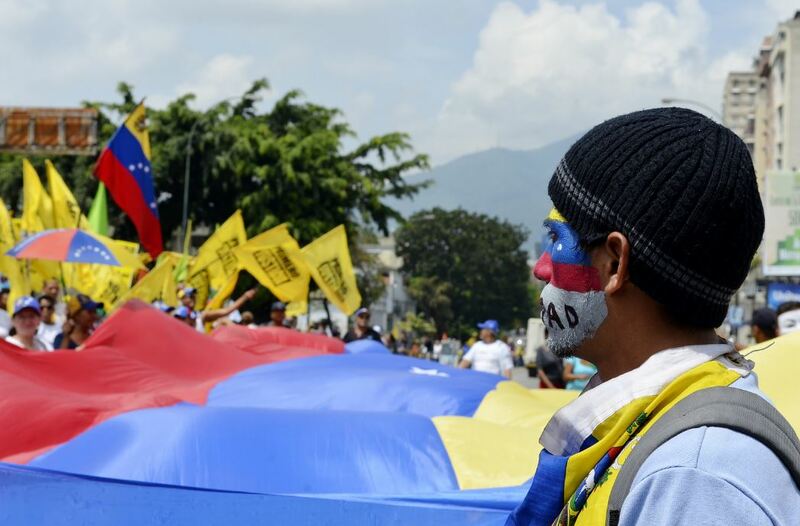 What mainstream accounts of Venezuela’s “peaceful” opposition leave out. The media narrative is clear: peaceful demonstrators upset about a collapsing economy and political repression are fighting an oppressive state in Venezuela. The actual history, however, is more murky. For more than a decade the Venezuelan opposition has used a variety of violent tactics to try to topple the country’s democratically elected government. An April 2002 coup deposed Hugo Chávez for forty-seven hours and led to multiple civilian deaths. Violent protests in April 2013 targeted government-run health clinics and other public institutions, resulting in at least seven civilian casualties; this occurred following the 2013 presidential election, which the opposition lost but refused to concede to the government. The early 2014 wave of protests resulted in forty-three deaths, half at the hands of the opposition. During the 2014 protests, opposition activists deliberately targeted state security forces and even strung galvanized wire across intersections, leading to the brutal decapitation of a motorcyclist. Nor can we omit mention of the approximately two hundred peasant leaders killed by ranchers opposed to the 2001 land reform law pushed by Chávez. This brutal history is almost totally absent from mainstream media depictions of the opposition. The same is true of leading opposition figures’ present-day celebrations of this violence. In mainstream accounts of last week’s protests in Caracas, the opposition is depicted as an essentially peaceful force, seeking to use constitutional means — a recall referendum — to legally put an end to an incompetent, repressive government. An article on the protests in the Wall Street Journal quotes an opposition supporter saying, “[D]on’t tell me that we didn’t try to demand change peacefully through the constitution.” The article briefly mentions the 2002 coup, but fails to note that leading members of today’s opposition played key roles in that episode. Nor does it make any mention of more recent instances of opposition violence. A New York Times article on the protests details the deteriorating conditions in Venezuela leading people to protest against the government, and provides ample coverage of claims that the government has repressed dissident politicians and foreign journalists. No mention is made of opposition violence. Like other mainstream articles, however, this piece focuses disproportionately on opposition allegations of instances of government repression. A piece in Bloomberg on the September 1 protests briefly discusses the 2014 protests, but misleadingly gives readers the impression that “over 40 people were killed” because of a government “crackdown on anti-government protests,” eliding the opposition’s responsibility for many of those deaths. The takeaway from these and other mainstream media stories about the protests is clear: the opposition is peaceful, and there is no reason to believe the government’s delusional and self-serving claims that it faces a real threat of a violent coup. Indeed, opposition leaders have repeatedly denied seeking a coup. But statements from these figures, not to mention recent history, indicate that the government may have more reason to worry than mainstream sources allow for. Other opposition leaders, such as Jesús Torrealba, have also made public statements that steer clear of explicitly calling on the military to overthrow the government, but still suggest that the military should actively support the opposition against President Maduro. One wonders how government officials in other countries would react if leading opposition figures made similar statements there? A good test of whether the opposition is as “peaceful” as media accounts suggest is to examine how opposition leaders speak about past episodes of violence. It’s telling that key opposition figures not only fail to express remorse or contrition when events such as the 2002 coup are discussed, but openly celebrate such acts. During a speech given on August 27, just days before the September 1 protests, Venezuelan National Assembly head and leading opposition figure Henry Ramos Allup repeatedly refers to the coup in an approving matter. In the speech Ramos Allup makes it clear that his only regret is that it did not succeed in ousting Chávez. No doubt, there is plenty to criticize about the Venezuelan government these days. The government deserves ample blame for mismanaging its currency and failing to confront corruption. State violence that does occur should be condemned and there’s a need for an independent left to grow in the country. But the narratives we’re being sold by the media are giving the opposition a free pass.